Not to be confused with "Match of the Day!" So hi, I'm new here and noticed that there is not a watch of the day thread, so I figured that I would start one. I'm sure that many of you wear different watches that have just been worked on, acquired or whatever. I tend to wear a watch on my left wrist for a while, whereas I find myself more frequently wearing a watch on the right too that I am testing or just because it appeals to me that day. How many of you do similar and how about posting pictures of the watch of the day, week or whatever? 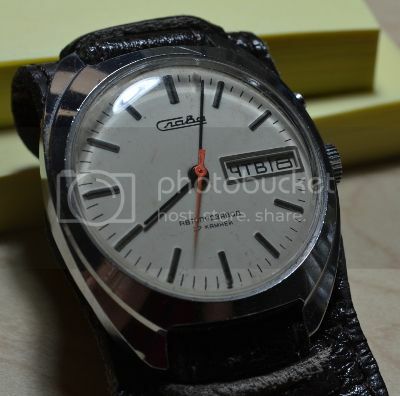 I will start it off with todays pick which is a very humble and slightly the worse for wear 1970's LCD Texas Instruments Quartz watch with super high quality plastic bezel, OK not so high a quality but still a fun simple watch with Time in hours and mins, push for seconds and date. I tried to attach a picture but it didn't attach and now there is no option to attach or upload a picture. Do I have to remotely link one into the post from a website? Here we go, the max filesize is stated as being 200mb, however it is actually 2mb so I have resized the original image. A remote link to the likes of Photobucket would be one way. You should be able to select a photo from your computer using the "Choose file" button. Then press the "Attach this file" button and a bar will appear indicating that the file is ready to be inserted. Finally press the "Add to post" button to insert the image into the post. The image will be dropped where the cursor is in the text, so first ensure you place the cursor where you want the image to show. Remember to check the preview to make sure it is the way you want it before posting as there is a time limit place on editing. It's a long time since I owned a liquid crystal watch, is this a type you have a particular interest in? Yes I figured it out thanks as the attach option was hidden in the "More Options" section. I'm not used to this particular forum software but will soon get used to it. I'm interested in more or less all kinds of watches, mostly mechanical analog watches but the 1970's LED and LCD watches are kind of fun too which was why I chose to wear that one yesterday. I was never a fan of them at the time but have grown to like them more over the years. You don't see many of them around anymore, especially on someone's wrist! and so it seemed appropriate to wear it. As it is now a new day, a new watch was called for and the pick of te day is a slightly tidier retro Jules Jurgenson Quartz watch. As a side note this topic HERE states there is a 2mb upload limit on attachments, the original I attempted to upload was 2.5mb or so and would have been the reason it didn't attach. When I click to attach it states max file upload size is 200mb which disagrees with what it is actually set at and in fact the screenshot posted above shows a 1gb upload limit which again seems to be at odds with actuality. Maybe someone got kilobytes and megabytes mixed up in the site upload settings options in the admin panel? 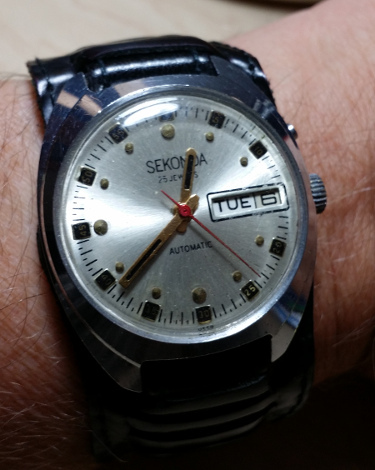 I wore the Sekonda today. This is one of two watches I ordered from Etsy a few months ago, the other being a Slava that shares the same movement and case, but with a different dial. So today I opted for a salvage job, I've had a 1971 Mohamed Ali Depraz watch kicking around for ages that was missing the dial when I got it so I have just fitted a generic dial and re-cased it. It might now be a Frankenwatch but better than just sat in a plastic storage box awaiting a part that I am probably not going to come across anyway, I think I much prefer the generic dial to the original anyway and at least it is now wearable. Above is what it would have looked like when it started life in 1971 and further below is what it looks like now. Wore the Shturmanskie today - a Poljot chronograph that I've owned since it was new. It's showing some wear now, mainly the missing chrono reset stud and not much chrome left on the crown. If anybody can suggest a source for Poljot parts, I'd be grateful! I think Mark recently posted a teardown of this movement. Interesting watch Gryf. Parts for Russian chronos are really hard to come by, I wish you luck with your quest. So a new day is upon us and today is the day for something a little different. 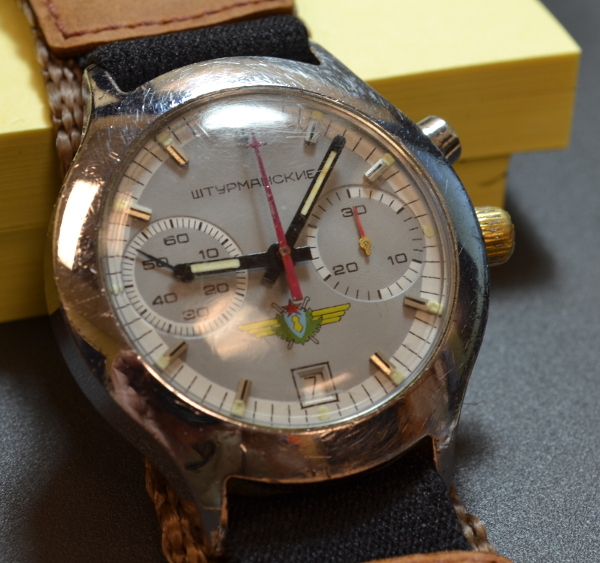 Today I chose a Dynasty Jump hour watch, I think these are possibly the manual forerunner to quartz digital watches. Hi Gryf - it might be worth looking at eBay watch sellers in places like the Ukraine and Bulgaria. Some of these people sell what may or may not be "franken" watches, but it's posible they are more likely to have access to Poljot parts because of that. There are some NOS pushers on ebay from Bulgaria for $14.99 + $4.99 shipping to the USA. Thanks, gents! I'll investigate those vendors ASAP. mk3 - thanks again for the eBay reference! Thanks to Buy It Now, I should have a couple of pushers winging my way from Bulgaria shortly. Today's pic is my Slava with day/date calendar. This watch, plus the Sekonda pictured above, were ordered from Ukraine via this vendor on Etsy. He has some interesting stuff, if you're into Russian watches, and his prices are pretty reasonable. @Gryf - You are welcome, I sent you a PM with the link for a NOS crown for your watch which is $7 + $4.99 shipping from Bulgaria, maybe even from the same seller. Not sure what the protocol is on posting non-permanent links. That should give you what you need to address the issues with your watch that you wanted to take care of. I hope this helps. Thanks for the other link too! I'll certainly look into it. Wearing my Ruhla UMF ...or is it UMF Ruhla? or even VEB Uhren und Maschinenfabrik Ruhla.. Anyway a nice honest little watch but will probably swap out with something a bit more robust for the weekend. That's a nice watch, I wonder what to wear tomorrow. Today I went with a what I consider to be a nice 1965 Omega Seamaster Cosmic, I have always particularly liked this watch.